The school has invested in mobile technologies, including iPads and laptops to serve as a tool in learning across the curriculum, as well as help develop pupil engagement and interest and computing skills in their own right. E-safety is another important element of the Computing curriculum this is taught discretely and through other curriculum areas where appropriate. Each year we also mark Safer Internet Day by addressing current issues which are affecting children both in our school and also in the wider community. 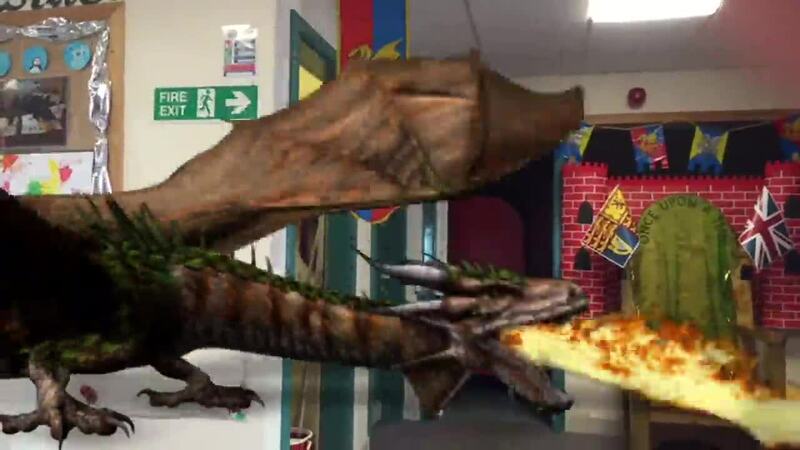 Using the Creatures FX app, teachers in Y1 were able to capture evidence of a dragon causing damage to the KS1 corridor! This caused great excitement across the whole school and the children in Year One produced some brilliant work linked to this discovery. Some children even decided that they should interview Miss Taylor as part of their role play in the 'News Room' and used iPads to record this.